The figure illustrates the use of the reagents described in Dionne et al. (GENETICS 2018) to generate cell-type-specific GAL4 lines using the split-Gal4 method. 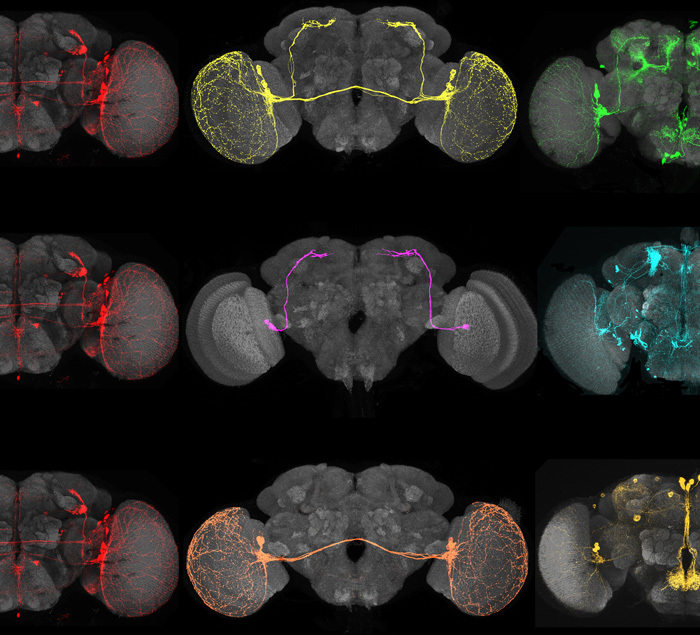 The center three brains in the center column show split-GAL4 lines for cell types involved in the circadian clock (large and small LNv cells) derived from the same AD hemidriver line (partial brain of the generation 1 GAL4 pattern shown on the left in red) combined with 3 different DBD hemidriver lines (shown in different colors on the right). Image by Heather Dionne / Janelia Flylight Project Team. See Dionne et al. The Annual Drosophila Research Conference is the premier place to share your research with the fruit fly community and discover cutting-edge advances. Presentations cover the full diversity of Drosophila investigations, from genetics to molecular biology, cell biology, development, immunology, physiology, neuroscience, evolution, and more. Register for Dros19 today to make sure you don’t miss the Technology & Techniques plenary session, and follow @GeneticsGSA on Twitter for more information on the 2019 fly meeting!